In search of new models, the company is attracting young independent designers from Italy who had a hand in the creation of the “Verona Green” wellies model. Natural rubber, rich matt rubber color, reliable zipper and buckles (how can we do without them?). A limited edition and available in two color combinations. 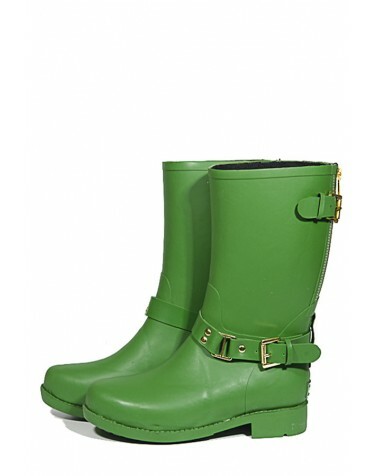 As with all BOOMBOOTS wellingtons, the “Verona Green” design comes packaged in a beautiful white box and can be a great gift for you and your loved ones. In search of new models, the company is attracting young independent designers from Italy who had a hand in the creation of the “Verona Green” wellies model. Natural rubber, rich matt rubber color, reliable zipper and buckles (how can we do without them?). A limited edition and available in two color combinations. As with all BOOMBOOTS wellingtons, the “Verona Green” design comes packaged in a beautiful white box and can be a great gift for you and your loved ones. Attention! Please choose SMALLER size.